All existing and new club members are invited to attend. As part of helping the club get ready for 2014, there is a feedback survey which all 2013 club members, coaches, and parents or junior players should fill in. Check out the Facebook group or email your coach for the link to the survey. Enjoying the festivities… and the spoils! On Friday the 29th the annual UTS sport Blues Awards were held. 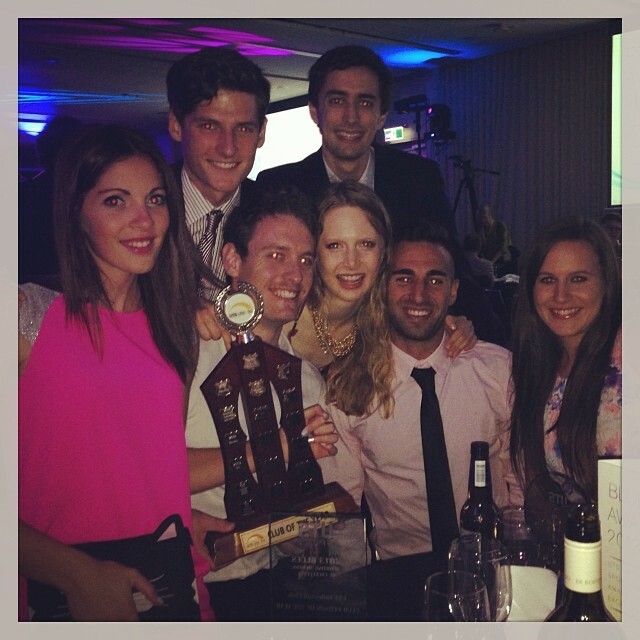 This is the night of nights for UTS Sports clubs and athletes. UTS volleyball had a strong showing with Ben Lalic, Alli Devlin, Caitlin Cockburn and Sam Morrison all receiving Half Blues for their efforts throughout the year (from memory this was more than any other club…. Although the memory is foggy due to lychee martinis). The Volleyball Club was also awarded Club of the Year for the first time since 2001. It was a close race for the trophy but with strong results all year at both SVL and the University Games the volleyball club snatched the prize. Thanks to all club members for a very successful year and let’s do it all again in 2014. You are currently browsing the UTSVC blog archives for December, 2013.